“We just wanted to kinda get back to rock.” The phrase may be a bit of a cliché, but is the perfect description of what The Buzzhorn is all about. Recently signing with Atlantic Records, the Milwaukee-based band is taking its first steps into the national limelight, with high hopes and realistic expectations. “As far as the national level and everything, you can keep your fingers crossed and hope that it all goes well. We just want to keep playing, and that’s really it,” reflects vocalist Ryan Mueller. The Buzzhorn are one of Milwaukee’s hottest bands, but were relatively unheard of outside of the city until recently. Advertising extensively and barely getting by financially, The Buzzhorn developed a strong, energetic fan base in the Milwaukee area. Ultimately, this, in combination with the band’s musical talent, caught the eyes and ears of Atlantic Records, offering The Buzzhorn the opportunity every band dreams of. On August 6 of this year, “Disconnected” hits stores, with the first single, “Ordinary” currently being added to radio play lists nationwide. Musically, The Buzzhorn have a lot going for them. A compilation of new tracks and a few songs borrowed from their two previous self-released albums, “Disconnected” shows the band’s depth and diversity. The care taken in writing and sonic perfection shines through in the thoughtful vocals and clean musical balance, offering fans a dose of straightforward rock in a world of nu-metal and pretty faces. With their fate resting in the hands of the masses upon the album’s release, Mueller is extremely optimistic, seeing the lack of hype as an advantage rather than an obstacle. “It’s a really cool time for us because everything is untested and anybody that comes out to see the band really isn’t expecting too much out of us because they’ve never heard of us.” With the mindset that every show is an opportunity to impress new fans, The Buzzhorn are hoping to hop on a national tour and show the world what they can do…and they just might. 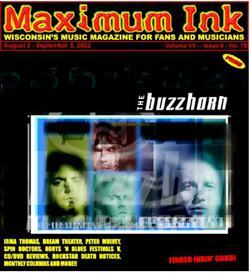 The Buzzhorn will be playing at The Annex in Madison August 8. They will also be at The Rave in Milwaukee August 9 and opening for Jerry Cantrell at The Quest in Minneapolis August 11.